A registered taxpayer can apply for transfer the matched Input Tax Credit available in the Electronic Credit Ledger to another business entity in case of transfer of business by way of sale of business / merger / demerger by filing of ITC declaration in FORM GST ITC-02. In case any registered entity undergo sale, merger, de-merger, amalgamation, lease or transfer, the acquired entity must file ITC declaration for transfer of ITC in the FORM GST ITC-02. The acquired / transferor entity must have matched Input Tax Credit available in the Electronic Credit Ledger, as on effective date of merger/ acquisition/ amalgamation / lease/ transfer. The acquiring entity (transferee) and acquired entity (transferor), both should be registered under the GST regime. All transactions categorized as pending for action of merging entity should be either accepted / rejected / modified, and any liabilities arising out of the returns filed by the transferor must be paid. The transfer of business should be with specific provision of transfer of liabilities which will be the stayed demands of tax, or in respect of litigation /recovery cases. It should be accompanied by the certificate issued by Chartered Accountant or Cost Accountant. 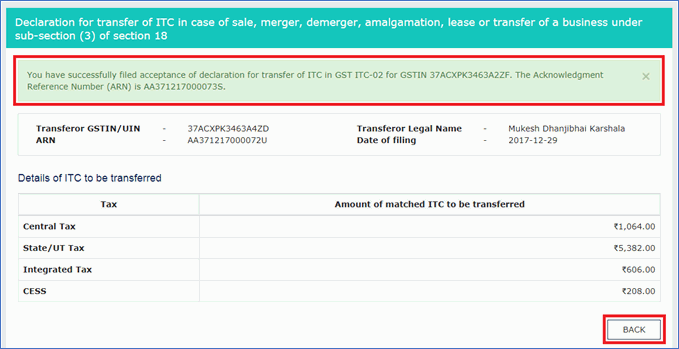 The acquired entity (transferor) files declaration in FORM GST ITC-02 in the GST portal, specifying the available matched ITC in each major head. The acquiring entity (transferee) accepts / rejects the same in GST portal. This user manual covers both aspects of the whole process. 1. Access the GST Portal. 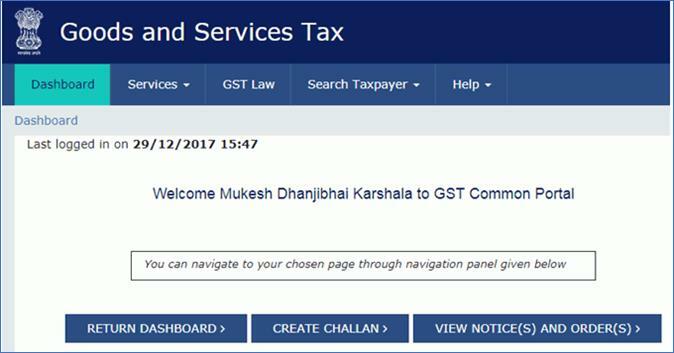 The GST Home page gets displayed. 2. Using your valid credentials, login to the GST Portal. The Taxpayer’s Dashboard (transferor) gets displayed. 3. Navigate to the Services > Returns > ITC Forms option. The GST ITC Forms page gets displayed. 4. Click the Prepare Online button on the GST ITC-02 tile. The FORM GST ITC-02 opens-up. The amounts of matched unused ITC get auto-filled from the transferor’s Electronic Credit Ledger. Transferor may choose to transfer all or partial ITC, as desired. 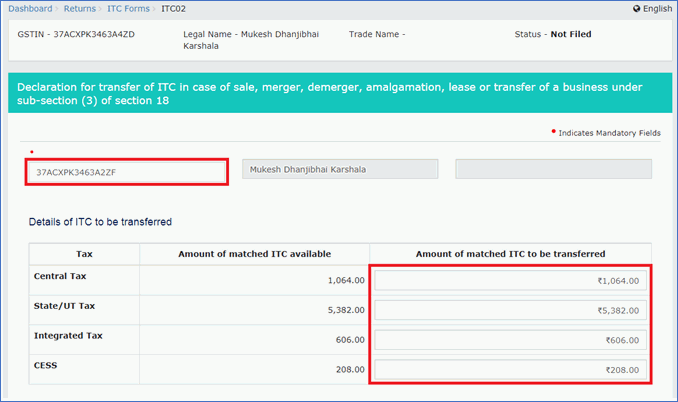 For each major head, the Amount of matched ITC to be transferred needs to be filled by the transferor. 5. Enter the GSTIN of the transferee. 6. Enter the Amount of matched ITC to be transferred for each major head under the Details of ITC to be transferred section. 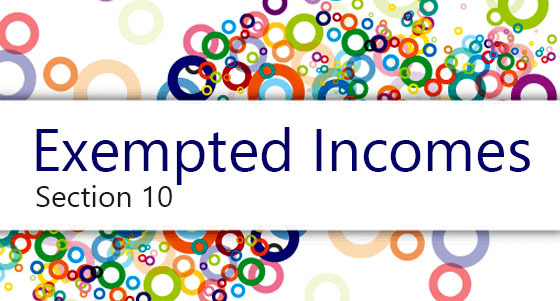 The entered amount must be less than or equal to the amount of ITC that is shown as available in the Electronic Credit Ledger. a). Name of the certifying accounting firm. b). Name of the certifying Chartered Accountant / Cost Accountant in the certifying firm. c). Membership number of the certifying firm. d). Date of certificate issued by the certifying accounting firm. 8. Attach a scanned copy of the certificate. The attachment should either be in JPEG / PDF format. File size of attachment should not exceed 500 KB. 9. Click SAVE to upload the entered data and the attachment to the GST Portal. The system will display a confirmation upon saving. 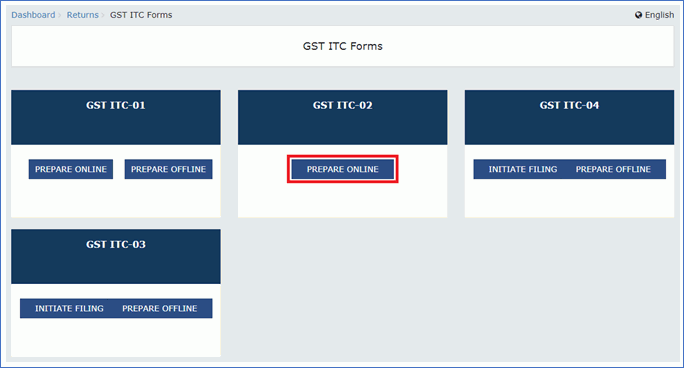 After saving the FORM GST ITC-02, if you return to this form at a later point in time, all the line items will get auto-populated as they were saved. You can also retrieve the saved FORM GST ITC-02 by navigating to Services à User Services à My Saved Applications. 10. Check the statement box to declare that the furnished information is true and correct. 11. Select an Authorised Signatory from the drop-down, containing a list of authorised signatories that you have configured in the system. 12. File the FORM GST ITC-02 either using the DSC or EVC option. If you choose the DSC option, make sure to sign with the DSC of selected authorised signatory. If you choose the EVC option, the system will send an OTP on the authorised signatory’s registered mobile phone number, which you’ll be required to enter in a pop-up that appears after selecting this option. This user manual has assumed the EVC path for simplicity. 13. Click PROCEED on the Warning pop-up message. 14. Enter the OTP as received. The system will display a confirmation message on successful filing of the FORM GST ITC-02. The confirmation message will also contain the system-generated ARN. You can download an offline copy of the filed FORM GST ITC-02 in PDF version by clicking the DOWNLOAD button. In the next stage, the transferee (acquiring unit) of the ITC needs to take an action on your filed FORM GST ITC-02. 16. Access the GST Portal and login with your valid credentials. 17. Navigate to the Services > User Services > ITC02 – Pending for actions option. The page, listing the FORM GST ITC-02 will open, requiring you to take action. A clickable link in the form of ARN. The transferor’s GSTIN and Trade Name. 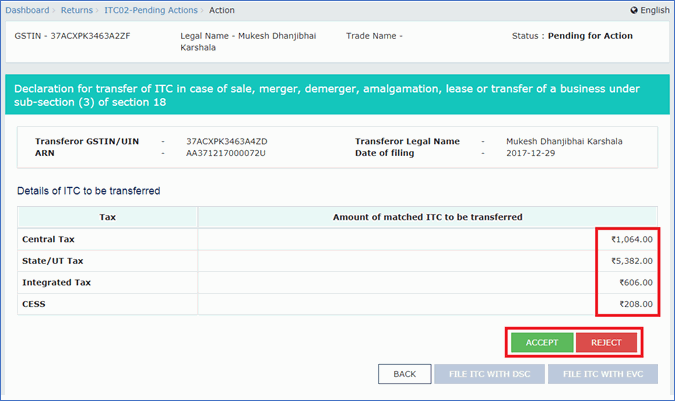 The filed details of ITC to be transferred corresponding to the selected ARN get displayed. 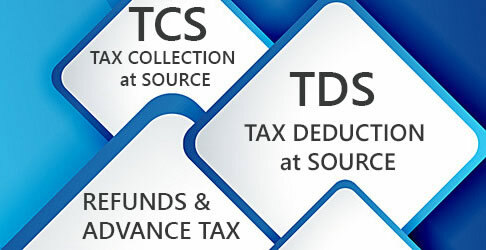 The details include the amount of matched ITC to be transferred against each of the major heads – Central Tax, State / UT Tax, Integrated Tax, and CESS. 19. Click either ACCEPT or REJECT based upon the decision that you want to exercise as the transferee. On ACCEPT: The ITC will be transferred to the transferee, and the Electronic Credit Ledger of the acquiring entity (transferee) will get updated. On REJECT: The ITC will not be transferred to the transferee, and the Electronic Credit Ledger of the acquired entity will receive back the ITC. The Electronic Credit Ledger of the merged entity (transferee) will not get affected. After clicking ACCEPT / REJECT on this screen, the transferee needs to file his response in the system to complete the process. Simply clicking the ACEEPT / REJECT button without completing the filing steps does not make any changes to Electronic Credit Ledgers of either transferor or transferee. This user manual assumes the acceptance of ITC transfer to show the successful completion of the ITC transfer process. 20. Assuming that we have clicked ACCEPT, the system will display a confirmation message, and will prompt the user to proceed with filing the response. 21. Check the declaration to state that the given information is true and correct. 22. Select an Authorised Signatory from the drop-down, containing a list of authorised signatories that you have configured in the system. 23. File the form either using the DSC or EVC option. 24. Click PROCEED on the Warning pop-up message. 25. Enter the OTP as received. The system will display a confirmation message on successfully completing the ITC transfer process. 27. 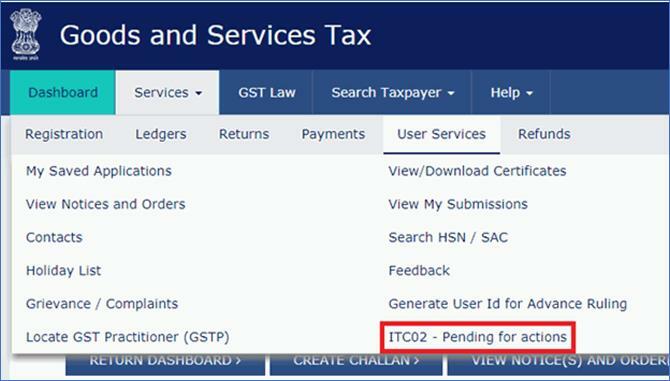 Click BACK to return to the ITC-02 – Pending for actions screen. 28. Notice the status changes to Accepted. 1. What are the pre-conditions for filing of ITC declaration in FORM GST ITC-02? 2. 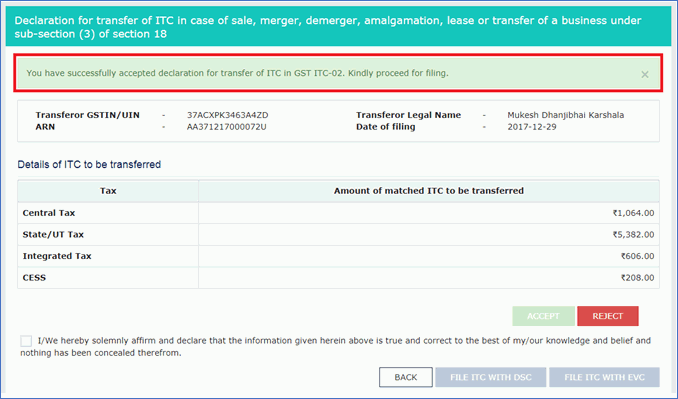 Which ITC can be transferred by filing FORM GST ITC-02? Such ITC appearing under the major heads – Central tax, State / UT tax, Integrated tax, and CESS can be transferred by filing FORM GST ITC-02. 3. 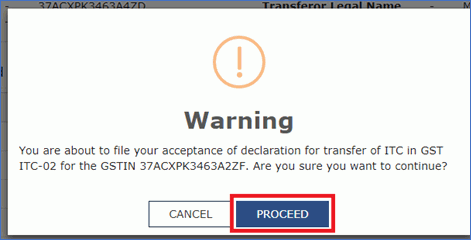 As an acquiring /transferee Entity, can I change my decision once the ACCEPT / REJECT button has been pressed? 4. What happens to the Electronic Credit Ledgers of Acquired Entity (transferor) as well as the Acquiring Entity (transferee), if the ITC transfer request filed through FORM GST ITC-02 is accepted or rejected in the system? 5. In case of demerger how much of the ITC would be transferred to the demerged entity or entities? 6. Which certificate from a practicing Chartered Accountant / Cost Accountant is required for filing FORM GST ITC-02?